GAF® asphalt shingles became America’s leading asphalt shingles for many reasons. One of the secrets why they cover more roofs than any other product today is their Advanced Protection® Technology. Thanks to this technology, GAF has taken asphalt shingle quality to new heights. Compared to old-fashioned products, the brand uses premium fiberglass mat to increase the strength and toughness of asphalt shingles. In the past, the norm was to apply more asphalt by weight just to meet industry requirements. GAF also optimizes weathering asphalt to create an uncompromising layer that protects your roof against the rigors of Mother Nature. Reinforced with premium limestones, the Advanced Protection Technology makes asphalt roofing in Westchester tough enough to withstand the most destructive elements. GAF is the only roofing manufacturer that can claim all of its shingles to pass two of the strictest wind resistance tests in the industry. Under controlled laboratory conditions, tests showed that GAF shingles with Dura Grip™ Adhesive locks remain in place under 110 to 150 mph winds with Advanced Protection. Even with heavy, wind-driven rains, all GAF shingles fare well. They all passed the AC438, the first series of tests for shingles that use innovative science to perform and stay unscratched over the long-term. 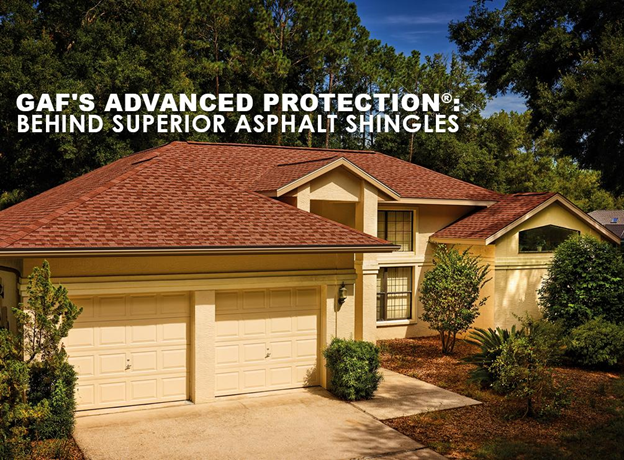 Advanced Protection keep the granules of GAF shingles uncompromised for the years to come. This solves the common dilemma of asphalt roofing in Connecticut, where the outermost layer of the shingles loses its charm after a few bouts of rough weather. Best of all, this technology makes GAF shingles more eco-friendly. It helps eliminate the unnecessary use of asphalt and limestone in the production without jeopardizing quality. With longer life spans, Advanced Protection helps delay the need for replacement GAF shingles. In turn, you get less unrecyclable waste ending up in landfills. GAF’s Advanced Protection revolutionizes asphalt shingles in practically all imaginable ways. To get your GAF roof replacement project, call Vinylume now at (866) 244-8029 to set your free consultation.